Ever wonder if you can translate texts in images such as Japanese comic manga to any language of your choice directly from your desktop? Well, it is now possible that you can do this all by yourself with just a few amazing tools. What we’ll be doing are mainly to perform a text recognition on an image using a technology we called OCR, Optical Character Recognition, and then translate whatever we extracted using a translator software. This site is in no way endorsed by or affiliated with any Software and tool mentioned in this post. Trademarks are the property of their respective owners. Capture2Text is not just an ordinary OCR tool which takes in your image and pour out whatever it scans in a messy bunch of plain texts. Instead, it allows you to directly highlight a portion of your screen, perform an OCR scan and save the results in your clipboard (similar to CTRL-C). Capture2Text doesn’t need any installation. Extract the downloaded zip file to any folder you prefer. I extracted mine to my desktop. Run the Capture2Text.exe in the folder. Capture2Text will then run in the background. 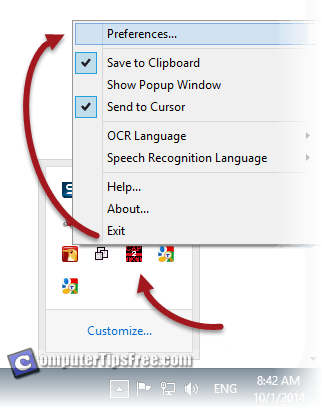 To access to its settings, go to your taskbar, rightclick capture2text icon and select preference. From there, you can set your desired hotkeys and other settings. Open any images and hit “windows key + Q” button (default). Highlight any words you want it to scan. It’ll then be copied right away. To translate them, you will need a translator software which we will explain it later. Other than just offering its amazing OCR service, Capture2Text is also capable of doing speech recognition which recognize speech directly from your microphone and save the results to your clipboard. What makes it amazing is that it’s a free to use software! To download or view more in-depth details about Capture2Text, visit here. As for translating the text we get from OCR, it’s entirely up to you on what translator software you want to use. You may just use Google Translate from your browser if you don’t think there’s a need for any software to be installed. Well, if you’re translating texts in a comic manga that appear to be phrase by phrase, you’re going to need a more handy tool such as ggtranslate or dualclip translator. These software allows you to directly translate whatever that is in your clipboard (whatever you’ve copied) with a single click. 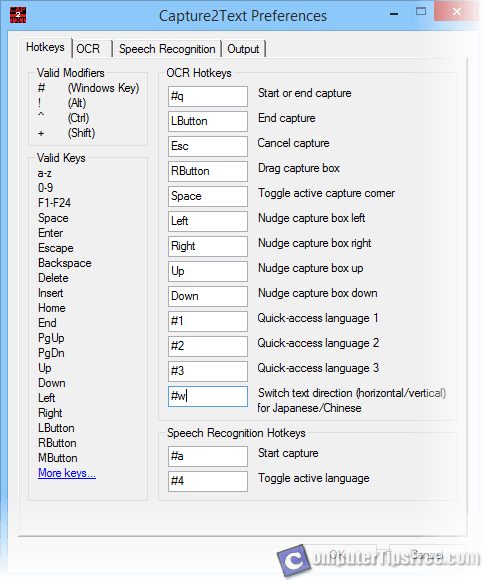 DualClip Translator is yet another amazing software which lets you translate (using Google Translate engine) any word or phrase you highlighted or copied (or from your clipboard) and show the result in a pop up balloon or window on your desktop. How does it work? It doesn’t require an installation. Just run the .jar file in its folder after extraction and it will run in the background. To translate words in the clipboard (words you’ve previously copied), hit alt-z (default) and the translated version will be shown immediately in a balloon or a window. 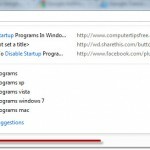 You can change the hotkeys and other settings from the taskbar icon -> Options. By using Capture2Text in combination with Dualclip translator, you get to instantly translate texts in images to your desired language with just a few clicks. To download DualClip Translator, visit here. 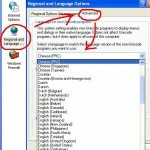 Google Translate Desktop is a free language translation software published by Ahtek for Windows PC’s. Unlike Dualclip translator, it doesn’t run in the background. Instead, it opens up a window (just like any other software) and that’s where you will be entering phrases for translation. Well, I prefer to use this because you don’t have to press any hotkey for it to translate your current clipboard. In other words, as soon as you copy a word or a phrase, it will automatically translate them and show the results in its window. 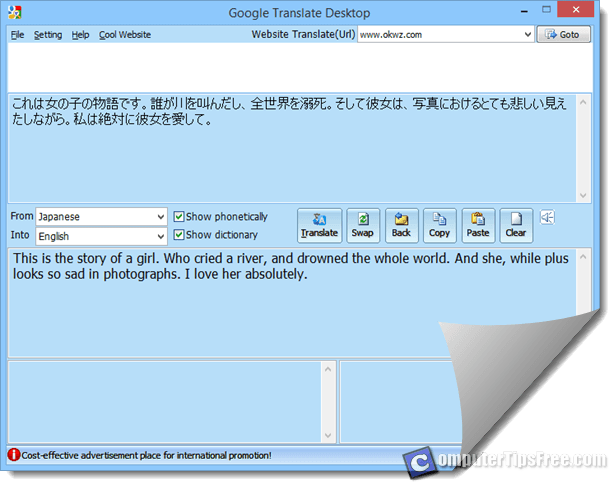 It’s best to use Capture2text along with this translator to achieve instant OCR translating. You wouldn’t even need to press a key for the translator to translate your clipboard. It just translate right away. To download Google Translate Desktop – GGtranslate, visit here. If the methods above couldn’t work for you, or you prefer a more mobile ways of doing things, you can use the OCR technology embedded in the Google Translate App which is only available to Android device users. What it does is that it will allows you to take a photo from the app itself, scan for words of your desired language, and translate them right away. Install Google Translate for Android and try it youself!